NETWORK FINALS: The rerun of AMERICA’S GOT TALENT lost 0.1 in final numbers. CABLE HIGHLIGHTS: It was a big night for news and weather. MSNBC’s RACHEL MADDOW SHOW topped the former with 0.37/0.57/3.7M, with CNN’s ANDERSON COOPER 360 at 0.30/0.39/1.4M, and Fox News’s HANNITY at 0.25/0.43/3M. Weather Channel’s hurricane coverage filled 9 of the Top 16 slots, led by the 10AM hour at 0.32. On HBO, REAL TIME WITH BILL MAHER ticked down to 0.31, and ANIMALS was steady at 0.05/171K . A&E’s LIVE PD clip show gained 0.03 to 0.30. ESPN’s COLLEGE FOOTBALL game was at 0.26. Food Network’s DINERS, DRIVE-INS & DIVES dipped 0.03 to 0.26. On History, IN SEARCH OF was at 0.26/0.21, compared to last week’s 0.17. 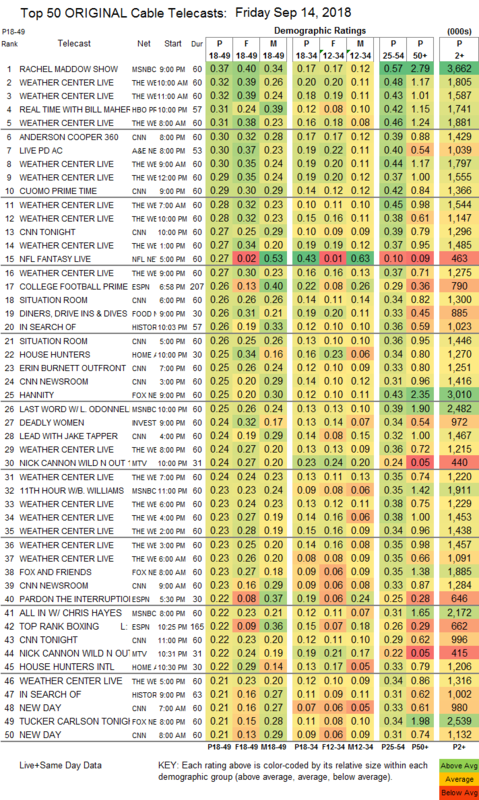 On HGTV, HOUSE HUNTERS was steady at 0.25, and HOUSE HUNTERS INTL was down 0.04 to 0.22. ID’s DEADLY WOMEN was at 0.24 and IN PLAIN SIGHT was at 0.20/0.19. 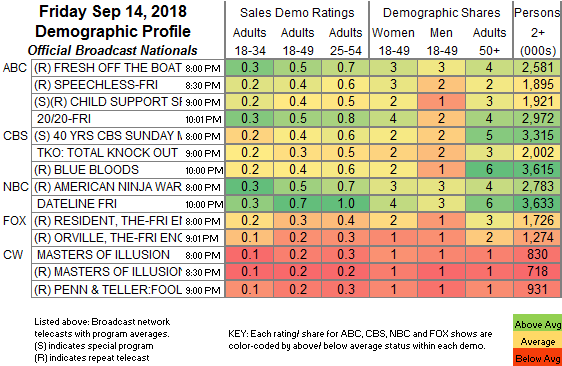 MTV’s WILD N OUT was at 0.24/0.22, compared to last week’s 0.28/0.26, and SAFEWORD fell a tenth to 0.13. On Discovery, TREASURE QUEST lost 0.02 to 0.18, and BATTLEBOTS was down 0.04 to 0.18. We’s MARRIAGE BOOT CAMP held at 0.15. On Syfy, WYNONNA EARP rose 0.02 to 0.13, and KILLJOYS was down 0.03 to 0.07. Cinemax’s OUTCAST stayed off the chart at 0.03/98K.